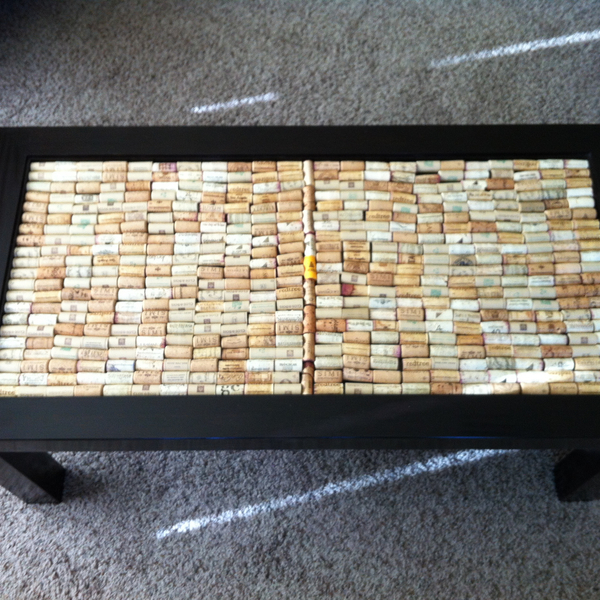 This modern table is designed to function as either a cork table or shadow-box table. The idea for the table took weeks to work out. 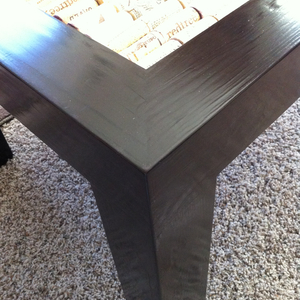 I wanted to build a table from recycled material that looked like it was built with new wood, rather than looking rustic. 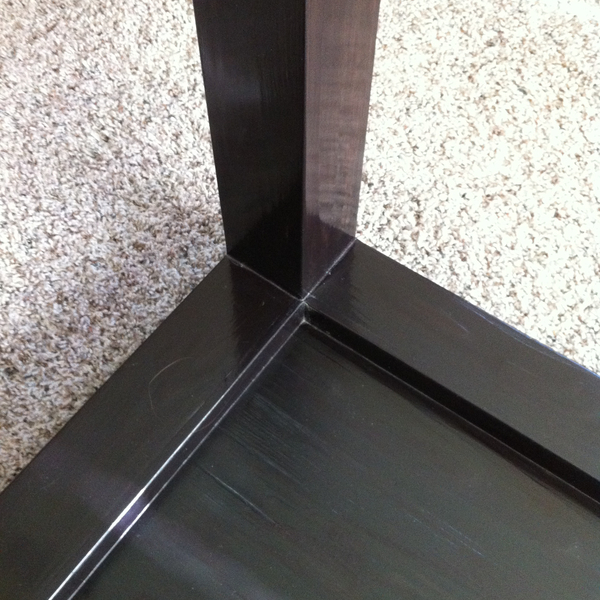 I also wanted the table to be flexible in its use and display. With that in mind, I built the display platform 3/4 inch below the deck (beneath the bottom of the glass top) so that the owner might display anything she/he chooses within the box. 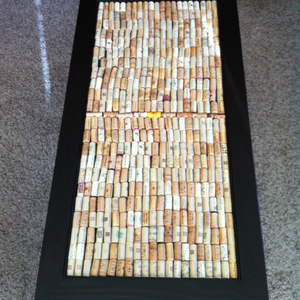 The primary design is a cork display table. However, the display box can also accommodate family photos, mineral/coin collections or holiday decorations (actually, anything less than 3/4 inch thick). 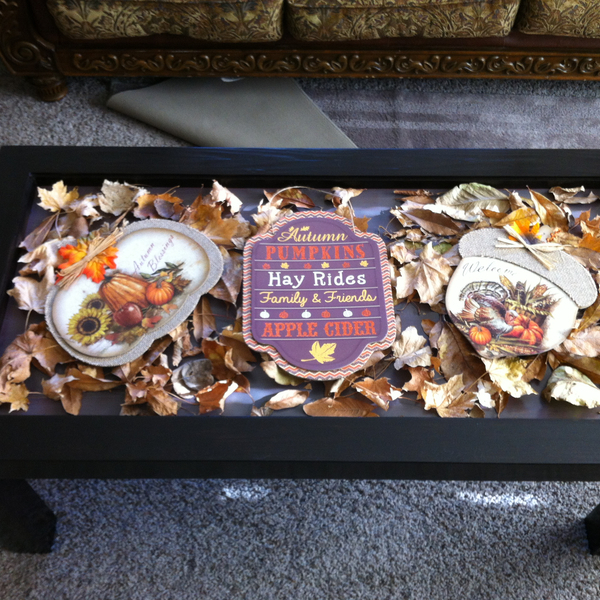 With this type of table, decorations can be changed out with the season, hobby, or mood of the owner. The legs, rails and insert are constructed from 100% recycled pallet wood (oak heart). The pallet lumber was milled down to 3/4" x 3 1/2" x 4' stock, mitered to 45 degrees along the edges, and bonded into box girders (the platform is from the same pallet stock, but milled with tongue-and-groove joints and bonded together). All pieces were then joined together with tenons. 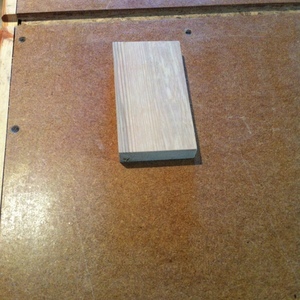 The degree of filling and sanding the project required absorbed the vast majority of time. Putty was required to fill nail holes, age cracks had to be glued and clamped, and the entire piece underwent thorough sanding using 80, 120, and 220 grit paper. 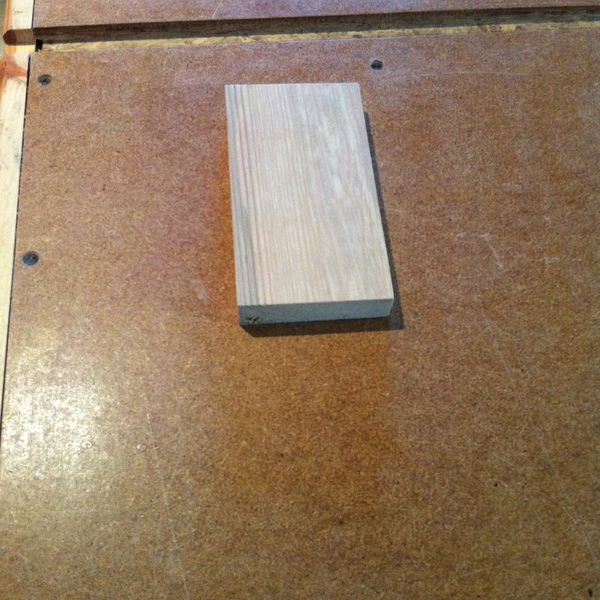 This is where the Ryobi sanders came in so handy. They got a good workout! Awesome job!!!! Love it :-). GORGEOUS! This would be great to change for every season! Nice job!! Beautiful design! 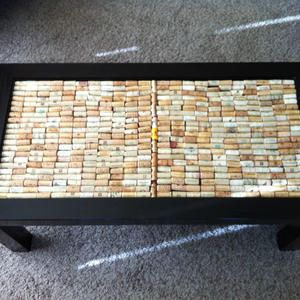 This modern table is designed to function as either a cork table or shadow-box table. The idea for the table took weeks to work out. I wanted to build a table from recycled material that looked like it was built with new wood, rather than looking rustic. I also wanted the table to be flexible in its use and display. With that in mind, I built the display platform 3/4 inch below the deck (beneath the bottom of the glass top) so that the owner might display anything she/he chooses within the box. 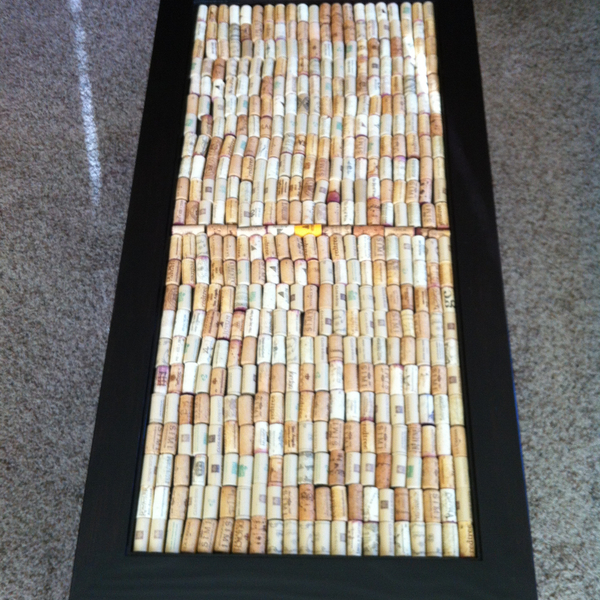 The primary design is a cork display table. However, the display box can also accommodate family photos, mineral/coin collections or holiday decorations (actually, anything less than 3/4 inch thick). 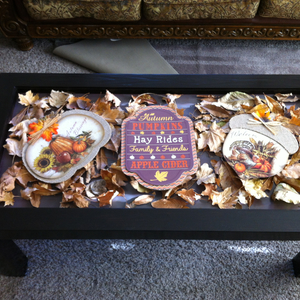 With this type of table, decorations can be changed out with the season, hobby, or mood of the owner. 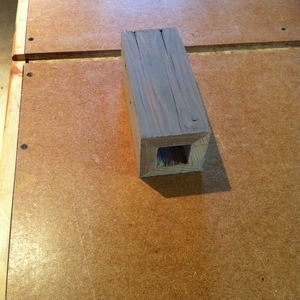 The legs, rails and insert are constructed from 100% recycled pallet wood (oak heart). The pallet lumber was milled down to 3/4" x 3 1/2" x 4' stock, mitered to 45 degrees along the edges, and bonded into box girders (the platform is from the same pallet stock, but milled with tongue-and-groove joints and bonded together). All pieces were then joined together with tenons. 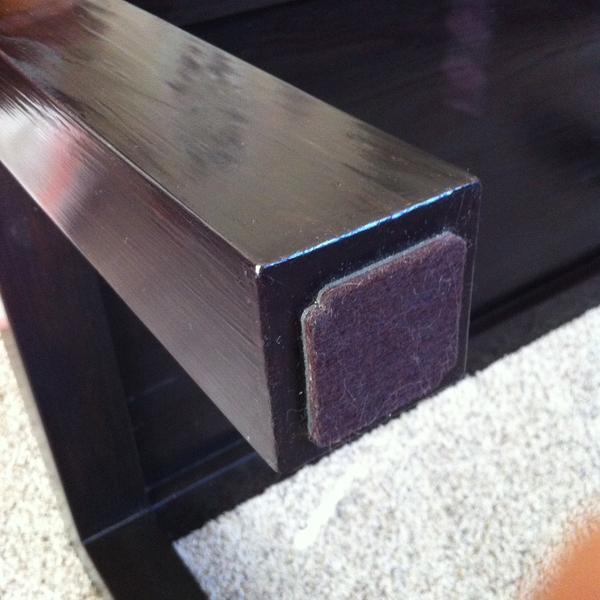 The degree of filling and sanding the project required absorbed the vast majority of time. Putty was required to fill nail holes, age cracks had to be glued and clamped, and the entire piece underwent thorough sanding using 80, 120, and 220 grit paper. 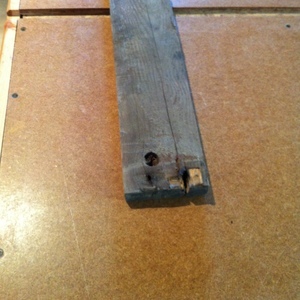 This is where the Ryobi sanders came in so handy. They got a good workout!